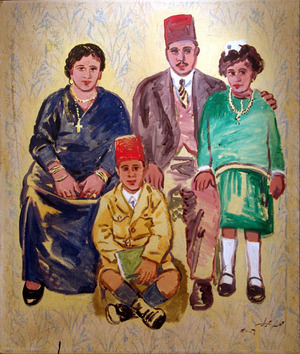 Zamalek Art Gallery, showcases an exclusive exhibition of �MASTERPIECES� of paintings & drawings for the most prominent Egyptian Artists; namely: Abdel Rahman Nachar, Farghali Abdel Hafiz, Gazbia Sirry, Hamed Owais, Mohamad Abla, Moustafa Abdel Moity, Rabab Nimr, Zeinab El Sageny. 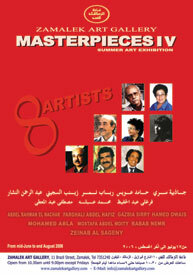 MasterpiecesIV hosts, this year the "Livre d'artiste", published by the Limited Editions Club, for the eminent author Naguib Mahfouz, the "Arabian nights & days" by artist Nazli Madkour. Original Art works and Graphic Portfolio of this collection are on display.